Florida Hospital Celebration Health has long recognized that nursing is a key factor in the efficient delivery of high quality patient care. Nursing also represents the hospital’s highest cost of labor. 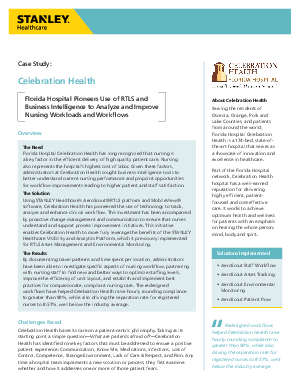 Given these factors, administrators at Celebration Health sought business intelligence tools to better understand current nursing performance and pinpoint opportunities for workflow improvements leading to higher patient and staff satisfaction. Read this case study to learn more about how Florida Hospital Pioneers used RTLS and business intelligence to analyze and improve nursing workloads and workflows.